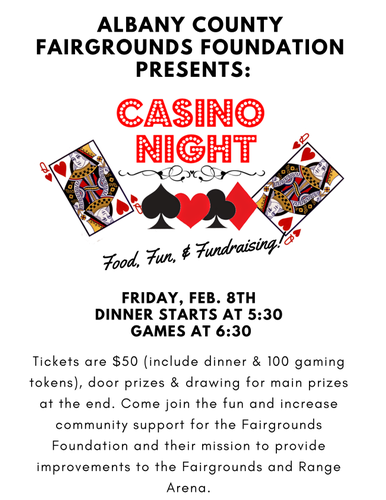 Join the Albany County Fairgrounds Foundation for a night of food, fun, and fundraising, at their annual Casino Night! Tickets are $50 and include dinner and 100 game tokens. There will also be a number of prizes throughout the night! Come join the fun and suport the Fairgrounds Foundation and their mission to provide improvements to the Fairgrounds and Range Arena. Tickets are $50, available at the door or from a foundation member.